I have tried yoga in the past. The non-stop raves I’ve heard from people always piqued my interest; and seeing the radiant Gwyneth Paltrow tote a yoga mat all over New York City and London was enough to make me realize that this could, quite possibly, be the sport for me – minimal sweating, cute clothes, peace and quiet. Really darlings, it sounds like a pricey, private resort getaway one would embark on for a weekend with the hope of unwinding and indulging in a little me time. But it didn’t work. Oh, I didn’t give up after a single try, mind you; I attempted to channel my inner Yoga Goddess more times than I could count, and each time I came away with nothing. I was uninterested, in pain, and felt as if the expected workout never even occurred. 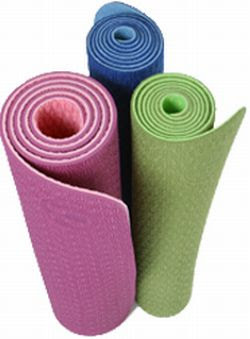 Now that I look back on it, however, I realize that perhaps the one item standing in my way of achieving complete and total yoga satisfaction was my chosen mat; thus, I have decided to give yoga another whirl, only this time I plan on arming myself with a perky Yoga Mat – Nike Coupons. Oh, I know it sounds quite ridiculous to someone who actually enjoys physical activities; but for someone who prefers the fashion world over fitness, there must be a few trendy motivating factors involved to truly inspire a person to pull themselves away from the latest issue of ELLE and into a Downward Facing Dog. These determinants, if you hadn’t already realized, don’t end simply with a pair of Victoria’s Secret yoga pants, or a flirty tank. No, they extend all the way to accessories; specifically, the mat. My last mat was a dreary thing the color of mud. Staring at it as I maneuvered myself into various pretzel-like poses only made me loathe the whole idea of yoga even more with each passing day; the feminine pink of the Nike Yoga Mat is bound to give me a brighter outlook about the whole idea based on its playful hue alone. And, all prettiness aside, the fact that it possesses a supreme amount of traction to prevent any Slip ‘n’ Slide moments from happening, is even more appealing. Okay, I have convinced myself. While I completely abhor the idea of anything strenuous, I have to admit that we must keep ourselves in tip top shape in order to don the funky fashions of the runway; therefore I will do it. I will place my pretty mat on the floor, don my wondrous workout accoutrements, and achieve complete and total serenity now; if only to acquire Gwyneth’s glow, of course. Are you ready to achieve a little serenity now, kittens? Thanks to Nike and Glamour Girlz for the pictures. have to buy another mat then! and yoga really can be painful, auch! I also achieve serenity by running and spinning! Serenity now! Love the colors of those mats =) You should try out biking. It really gives you a good feeling when you are done! Thanks for visiting my blog and leaving such a sweet comment. I love yoga, I really need a new mat actually, I had a gorgeous pink one but I'm not sure what happened to it. I've taken a few yoga classes and I really enjoy. I should take some regular classes- i think my mind/body needs something like that right now! I love that pink Nike yoga mat. I did yoga for sometime and it felt good. I didn't enroll in any yoga class. I just bought a DVD and I followed the instructions there. The thing with yoga is it made me leaner and (i guess) taller. I love these calming colors! Great mats!! Mine isn't the color of mud :) But close to it... dreary grey. I clearly need a pink one now!! I can't do yoga. I get so bored--I am so a high impact girl. we have 2 purple ones, but i never do yoga on them. I use them for my abdominal exercises ;D.
I've tried to do yoga as well, but tthat failed horribly. Maybe a new mat really is all I need. Only one way of finding out! I have always wanted to try yoga. My dad was a yoga instructor for years but gave it up before I was born. It seems so relaxing and a great way to get into shape! I have the yoga pants and the mat...what I am seriously lacking is the ability to shut my brain off and focus! I am so high strung! Shocking, right? I need to relax. I need to actually use my yogaworks pass. Thanks for the inspiration my darling!!! yoga and pilates are my favorite way to exercise; i always leave feeling so refreshed! 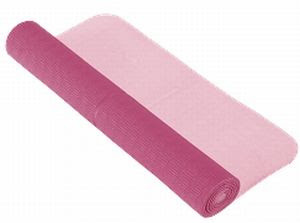 Although I do own a lovely pink mat similar to the ones you have posted, for some reason I just can't get into yoga. I know if I just gave it a chance and actually stayed focus in class, I would just love it. It's a really great workout both mentally and physically. Enjoy your peace and quiet my friend! For the both of us! i'd love to become a yogi, i think it's such an interesting way to be active. i love the bright colored mats, good job on giving it another try! yoga is awesome!! You will love it! What a coincidence, I just joined a club in my school that does yoga. I've tried it before but I think I was doing it wrong and just continued cardio and some pilates (which is similar)instead. Looking forward to trying this out again. I haven't done yoga since college. Boy was I flexible then! Hmm. Maybe I need to take up yoga just so I can buy a cute, pink mat... The most yoga I've done is on my Wii Fit. Now that wasn't so bad. Haha! I did yoga a few years back. I've been thinking about starting back. I need something to help me out. I'm a walker - I go for four - five hour walks on the weekend - I adore them but I feel a bit of yoga wouldn't go astray either! I think I'm a bit shy about showing the world my bod in tracksuit pants!!! Someday I will feel the fear and do it anyway!! Good luck with this attempt! I did yoga all summer, it was truley wonderous! I have the same kind of thing with dance- cute exercise clothes makes me work so much harder! i never try to yoga, but that sounds painful. no? Oh i love yoga. .. I am sore from my class yesterday! thanks for the reminding me that I should start attending my yoga classes again hahahaha, I've been so lazy, it's awful! This made me laugh so! I'm with you...I'd rather pick out the gear than actually do the exercises. But Gwyneth looks so good...talk about inspiration. I adore yoga... but maybe most of that reason is because my mat is an adorable shade of pink? Let us know if you like it this time around! I have a bright pink yoga mat and I love it! I think you are right, the color/pattern of the mat is important. I don't usually do much yoga on it though, I do more pilates and other cardio. But it's better with the mat! Yoga is an amazing part of my life! When I do yoga I feel more centered and relaxed. If you're looking for the same workout you would get from cardio then you might want to try something else - yoga is more about toning and lengthening than it is about calorie burning. yoga and running for me.